While picking up groceries for the week, a shopper may compare brands, prices, and nutritional information to ensure they make economical and healthy choices for their family. 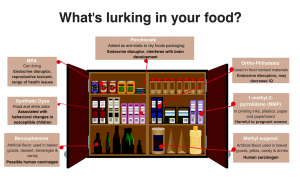 Unfortunately, there’s much more to our food than meets the eye – or makes the label. Approximately 10,000 food additives are allowed in our food. Food additives are substances used to flavor, color, preserve, package, process, and store our food. While some of the chemicals added to food or used in packaging are harmless, others are downright dangerous and linked to health concerns. Certain additives are linked to reproductive problems, developmental issues, and even cancer. Perchlorate was approved in 2005 as a component of plastic packaging for dry food despite the fact that it is a known endocrine disruptor that impairs infant brain development. Benzophenone – an artificial flavor added to baked goods, dessert, beverages, and candy – is classified as a possible human carcinogen. The list goes on. No matter where you shop, your family’s health may be at risk. 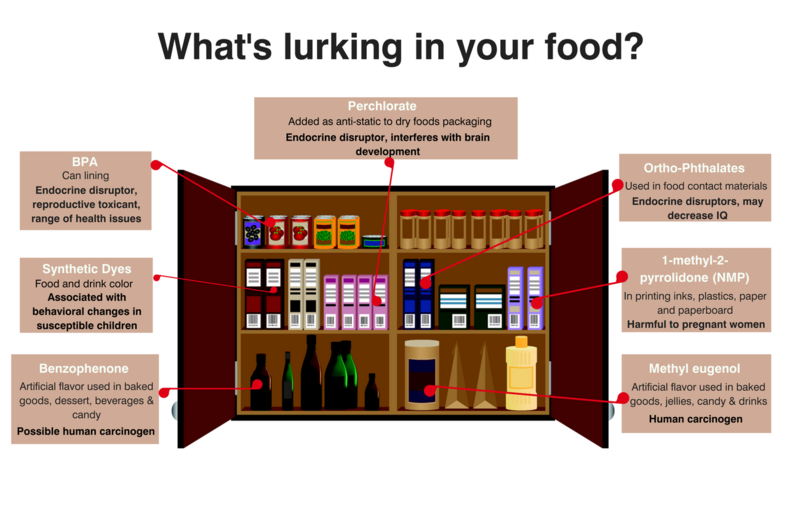 Check out the cupboard below to see what else could be lurking in your food.